Mr. Vice President, Madam Speaker, Mr. Prime Minister, members of Lok Sabha and Rajya Sabha, and most of all, the people of India. Over the past three days, my wife Michelle and I have experienced the - and dynamism of India and its people - from the majesty of Humayun’s Tomb to the advanced technologies that are empowering farmers and women who are the backbone of Indian society; from the Diwali celebrations with schoolchildren to the innovators who are fueling India’s economic rise; from the university students who will chart India’s future, to you —-leaders who helped to bring India to this moment of extraordinary promise. And it is my firm belief that the relationship between the United States and India -— bound by our shared interests and our shared values -— will be one of the defining partnerships of the 21st century. This is the partnership I’ve come here to build. This is the vision that our nations can realize together. An ancient civilization of science and innovation; a fundamental faith in human progress - this is the sturdy foundation upon which you have built ever since that stroke of midnight when the tricolor was raised over a free and independent India. (Applause.) And despite the skeptics who said this country was simply too poor, or too vast, or too diverse to succeed, you surmounted overwhelming odds and became a model to the world. Instead of slipping into starvation, you launched a Green Revolution that fed millions. Instead of becoming dependent on commodities and exports, you invested in science and technology and in your greatest resource —- the Indian people. And the world sees the results, from the supercomputers you build to the Indian flag that you put on the moon. Instead of resisting the global economy, you became one of its engines —- reforming the licensing raj and unleashing an economic marvel that has lifted tens of millions of people from poverty and created one of the world’s largest middle classes. Now, just as India has changed, so, too, has the relationship between our two nations. In the decades after independence, India advanced its interests as a proud leader of the nonaligned movement. Yet, too often, the United States and India found ourselves on opposite sides of a North-`South divide, estranged by a long Cold War. Those days are over. So since that time, people in both our countries have asked: What’s next? How can we build on this progress and realize the full potential of our partnership? That’s what I want to address today —- the future that the United States seeks in an interconnected world, and why I believe that India is indispensable to this vision; how we can forge a truly global partnership -— not just in one or two areas, but across many; not just for our mutual benefit, but for the benefit of the world. The United States seeks security —- the security of our country, our allies and partners. We seek prosperity -— a strong and growing economy in an open international economic system. We seek respect for universal values. And we seek a just and sustainable international order that promotes peace and security by meeting global challenges through stronger global cooperation. Now, to advance these interests, I have committed the United States to comprehensive engagement with the world, based on mutual interest and mutual respect. And a central pillar of this engagement is forging deeper cooperation with 21st century centers of influence -— and that must necessarily include India. Since taking office, I’ve, therefore, made our relationship a priority. I was proud to welcome Prime Minister Singh for the first official state visit of my presidency. (Applause.) For the first time ever, our governments are working together across the whole range of common challenges that we face. Now, let me say it as clearly as I can: The United States not only welcomes India as a rising global power, we fervently support it, and we have worked to help make it a reality. In short, with India assuming its rightful place in the world, we have an historic opportunity to make the relationship between our two countries a defining partnership of the century ahead. And I believe we can do so by working together in three important areas. We can pursue joint research and development to create green jobs; give India more access to cleaner, affordable energy; meet the commitments we made at Copenhagen; and show the possibilities of low-carbon growth. And together, we can resist the protectionism that stifles growth and innovation. The United States remains —- and will continue to remain —- one of the most open economies in the world. And by opening markets and reducing barriers to foreign investment, India can realize its full economic potential as well. As G20 partners, we can make sure the global economic recovery is strong and is durable. And we can keep striving for a Doha Round that is ambitious and is balanced —- with the courage to make the compromises that are necessary so global trade works for all economies. Together, we can strengthen agriculture. Cooperation between Indian and American researchers and scientists sparked the Green Revolution. Today, India is a leader in using technology to empower farmers, like those I met yesterday who get free updates on market and weather conditions on their cell phones. And the United States is a leader in agricultural productivity and research. Now, as farmers and rural areas face the effects of climate change and drought, we’ll work together to spark a second, more sustainable Evergreen Revolution. Together, we’re improving Indian weather forecasting systems before the next monsoon season. We aim to help millions of Indian farmers - farming households save water and increase productivity, improve food processing so crops don’t spoil on the way to market, and enhance climate and crop forecasting to avoid losses that cripple communities and drive up food prices. And as part of our food security initiative, we’re going to share India’s expertise with farmers in Africa. And this is an indication of India’s rise —- that we can now export hard-earned expertise to countries that see India as a model for agricultural development. It’s another powerful example of how American and Indian partnership can address an urgent global challenge. Because the wealth of a nation also depends on the health of its people, we’ll continue to support India’s effort against diseases like tuberculosis and HIV/AIDS, and as global partners, we’ll work to improve global health by preventing the spread of pandemic flu. And because knowledge is the currency of the 21st century, we will increase exchanges between our students, our colleges and our universities, which are among the best in the world. As we work to advance our shared prosperity, we can partner to address a second priority —- and that is our shared security. In Mumbai, I met with the courageous families and survivors of that barbaric attack. And here in Parliament, which was itself targeted because of the democracy it represents, we honor the memory of all those who have been taken from us, including American citizens on 26/11 and Indian citizens on 9/11. This is the bond that we share. It’s why we insist that nothing ever justifies the slaughter of innocent men, women and children. It’s why we’re working together, more closely than ever, to prevent terrorist attacks and to deepen our cooperation even further. And it’s why, as strong and resilient societies, we refuse to live in fear. We will not sacrifice the values and rule of law that defines us, and we will never waver in the defense of our people. America’s fight against al Qaeda and its terrorist affiliates is why we persevere in Afghanistan, where major development assistance from India has improved the lives of the Afghan people. We’re making progress in our mission to break the Taliban’s momentum and to train Afghan forces so they can take the lead for their security. And while I have made it clear that American forces will begin the transition to Afghan responsibility next summer, I’ve also made it clear that America’s commitment to the Afghan people will endure. The United States will not abandon the people of Afghanistan -— or the region -— to violent extremists who threaten us all. Our strategy to disrupt and dismantle and defeat al Qaeda and its affiliates has to succeed on both sides of the border. And that’s why we have worked with the Pakistani government to address the threat of terrorist networks in the border region. The Pakistani government increasingly recognizes that these networks are not just a threat outside of Pakistan —- they are a threat to the Pakistani people, as well. They’ve suffered greatly at the hands of violent extremists over the last several years. And we’ll continue to insist to Pakistan's leaders that terrorist safe havens within their borders are unacceptable, and that terrorists behind the Mumbai attacks must be brought to justice. (Applause.) We must also recognize that all of us have an interest in both an Afghanistan and a Pakistan that is stable and prosperous and democratic —- and India has an interest in that, as well. In pursuit of regional security, we will continue to welcome dialogue between India and Pakistan, even as we recognize that disputes between your two countries can only be resolved by the people of your two countries. 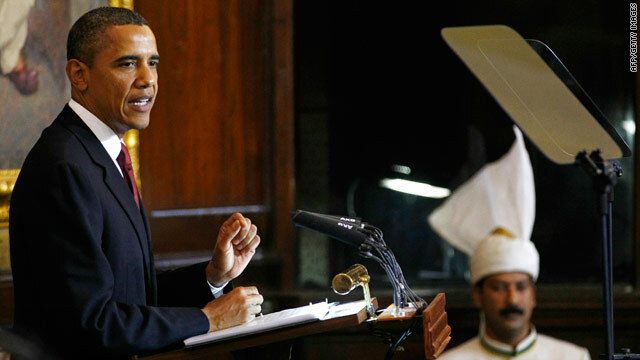 More broadly, India and the United States can partner in Asia. Today, the United States is once again playing a leadership role in Asia —- strengthening old alliances; deepening relationships, as we are doing with China; and we’re reengaging with regional organizations like ASEAN and joining the East Asia summit —- organizations in which India is also a partner. Like your neighbors in Southeast Asia, we want India not only to “look East,” we want India to “engage East” —- because it will increase the security and prosperity of all our nations. Now, let me suggest that with increased power comes increased responsibility. The United Nations exists to fulfill its founding ideals of preserving peace and security, promoting global cooperation, and advancing human rights. These are the responsibilities of all nations, but especially those that seek to lead in the 21st century. And so we look forward to working with India —- and other nations that aspire to Security Council membership -— to ensure that the Security Council is effective; that resolutions are implemented, that sanctions are enforced; that we strengthen the international norms which recognize the rights and responsibilities of all nations and all individuals. This includes our responsibility to prevent the spread of nuclear weapons. Since I took office, the United States has reduced the role of nuclear weapons in our national security strategy, and we've agreed with Russia to reduce our own arsenals. We have put preventing nuclear proliferation and nuclear terrorism at the top of our nuclear agenda, and we have strengthened the cornerstone of the global non-proliferation regime, which is the Nuclear Non-Proliferation Treaty. And this leads me to the final area where our countries can partner —- strengthening the foundations of democratic governance, not only at home but abroad. In the United States, my administration has worked to make government more open and transparent and accountable to people. Here in India, you’re harnessing technologies to do the same, as I saw yesterday at an expo in Mumbai. Your landmark Right to Information Act is empowering citizens with the ability to get the services to which they’re entitled - (applause) - and to hold officials accountable. Voters can get information about candidates by text message. And you’re delivering education and health care services to rural communities, as I saw yesterday when I joined an e-panchayat with villagers in Rajasthan. Now, in a new collaboration on open government, our two countries are going to share our experience, identify what works, and develop the next generation of tools to empower citizens. And in another example of how American and Indian partnership can address global challenges, we’re going to share these innovations with civil society groups and countries around the world. We’re going to show that democracy, more than any other form of government, delivers for the common man —- and woman. Likewise, when Indians vote, the whole world watches. Thousands of political parties; hundreds of thousands of polling centers; millions of candidates and poll workers - and 700 million voters. There’s nothing like it on the planet. There is so much that countries transitioning to democracy could learn from India’s experience, so much expertise that India can share with the world. And that, too, is what is possible when the world’s largest democracy embraces its role as a global leader. As the world’s two largest democracies, we must never forget that the price of our own freedom is standing up for the freedom of others. (Applause.) Indians know this, for it is the story of your nation. Before he ever began his struggle for Indian independence, Gandhi stood up for the rights of Indians in South Africa. Just as others, including the United States, supported Indian independence, India championed the self-determination of peoples from Africa to Asia as they, too, broke free from colonialism. (Applause.) And along with the United States, you’ve been a leader in supporting democratic development and civil society groups around the world. And this, too, is part of India’s greatness. Now, we all understand every country will follow its own path. No one nation has a monopoly on wisdom, and no nation should ever try to impose its values on another. But when peaceful democratic movements are suppressed —- as they have been in Burma, for example - then the democracies of the world cannot remain silent. For it is unacceptable to gun down peaceful protestors and incarcerate political prisoners decade after decade. It is unacceptable to hold the aspirations of an entire people hostage to the greed and paranoia of bankrupt regimes. It is unacceptable to steal elections, as the regime in Burma has done again for all the world to see. Faced with such gross violations of human rights, it is the responsibility of the international community —- especially leaders like the United States and India —- to condemn it. And if I can be frank, in international fora, India has often shied away from some of these issues. But speaking up for those who cannot do so for themselves is not interfering in the affairs of other countries. It’s not violating the rights of sovereign nations. It is staying true to our democratic principles. It is giving meaning to the human rights that we say are universal. And it sustains the progress that in Asia and around the world has helped turn dictatorships into democracies and ultimately increased our security in the world. So promoting shared prosperity, preserving peace and security, strengthening democratic governance and human rights - these are the responsibilities of leadership. And as global partners, this is the leadership that the United States and India can offer in the 21st century. Ultimately, though, this cannot be a relationship only between presidents and prime ministers, or in the halls of this Parliament. Ultimately, this must be a partnership between our peoples. (Applause.) So I want to conclude by speaking directly to the people of India who are watching today. In your lives, you have overcome odds that might have overwhelmed a lesser country. In just decades, you have achieved progress and development that took other nations centuries. You are now assuming your rightful place as a leader among nations. Your parents and grandparents imagined this. Your children and grandchildren will look back on this. But only this generation of Indians can seize the possibilities of the moment. We believe that no matter where you live —- whether a village in Punjab or the bylanes of Chandni Chowk - (laughter) - an old section of Kolkata or a new high-rise in Bangalore - every person deserves the same chance to live in security and dignity, to get an education, to find work, to give their children a better future. This is the story of India; this is the story of America —- that despite their differences, people can see themselves in one another, and work together and succeed together as one proud nation. And it can be the spirit of partnership between our nations —- that even as we honor the histories which in different times kept us apart, even as we preserve what makes us unique in a globalized world, we can recognize how much we can achieve together. And if we let this simple concept be our guide, if we pursue the vision I’ve described today —- a global partnership to meet global challenges —- then I have no doubt that future generations —- Indians and Americans —- will live in a world that is more prosperous and more secure and more just because of the bonds that our generation has forged today. Madan,The youth's interest in the west has to do with their need for viattily and colour in their lives. In my humble opinion; with the exception of a handful of people who purely pursue a spiritual ideal and are following purely their soul and nothing else, most people lead a mixed life leaning as much on external things for support as within themselves, they look for support in Mind and Soul. The current generation feels a total disconnect from the embellishments of spiritual life such as rituals and rites, religions and traditions etc; which by the way have long ceased to be embellishments but are now serious ill-habits. Repeating the Gayatri Mantra hundred times a day without sincerely listening to each syllable and striving to know its meaning is to me as insincere as religious' middle-class India's terrible habit of burping out the word OM' after every grand meal! But why in the first place would the youth feel this disconnect with religion, with spiritual life? Obviously because they can't see or haven't experienced the spirit. Their common sense tells them to go after what they can see. So they turn to the west where they find colour and life. True spiritual experiences come to the patient and perseverant individuals, and therefore might for a long while not be for the masses like the Harry Potter books which appeal to the vital and the imagination alone.